This was one of the first cards I created this year. It’s made up of some bits and bobs that had been languishing at the bottom of my Christmas craft drawer. The snowy branch design was once again, free with a magazine, although I got it so long ago that I have no idea which one. I blinged it up a bit by adding glitter glue and mounted it onto some silver holographic starred cardstock. This makes it nice and sparkly, which I think works well against the subtlety of the organza snowflake ribbon, which I received in a swap. Cut out a snowy branch from the free papers of a magazine, or alternatively make your own by rubber stamping the image of a branch, and then adding snowflakes around it. Mount the branch onto holographic silver cardstock, and cut around it again, leaving a narrow border. Highlight the snowflakes on the branch with some iridescent glitter glue. Fix a long strip of snowflake ribbon a quarter of the way up a narrow card blank. Mount the snowy branch topper to the right of the card, overlapping the ribbon. 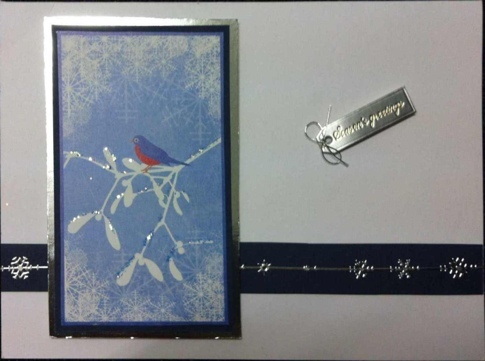 Use adhesive foam pads to make the branch stand out from the card. Place a small greeting peel-off just above the ribbon on the left of the card. Organza ribbon can be really hard to fix to a card successfully because if you use glue or tape it will show through. I tend to cut the ribbon long, fold it around the edge of the card, and then use double sided tape to secure it on the reverse. This looks neat from the front, but untidy from inside the card unless you also use a card insert, which is simply a piece of paper cut to the same size as the card, and glued to the inside of the card front. Inserts help to hide all manner of things – the legs from a brad for example. The other advantage of using inserts in lots of you cards is that you can print out your greeting onto them, saving many precious Christmas card writing minutes! More magazine freebies! I’m sure they would be quite easy to make from scratch too though, especially if you have a die-cutting machine. These are quite little cards and the stars measure 7cm at the widest point. Cut out a star shape from the free papers of a magazine, or cut a star shape out from card stock and decorate. Mount the star onto some shiny or iridescent cardstock, and cut out. Highlight around the sides with glitter glue. Accent each corner using buttons or gems. 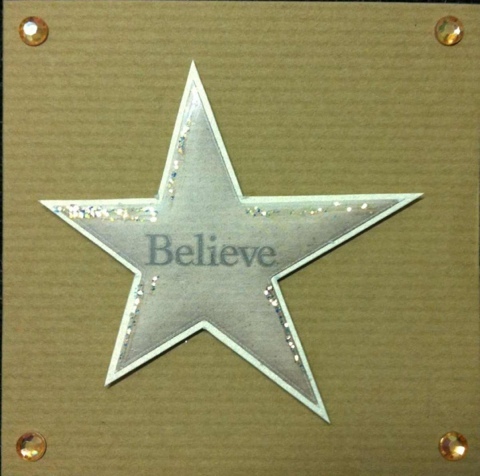 The brown cardstock in the ‘Believe’ card is called Kraft card, and seems to be quite fashionable at present. Yes, it’s surprising, but even crafting has its fads and fashions! I’ve made loads of these this year! Great for making bulk lots of cards as they are quick, easy and cheap to make, and can easily be made unique, or even tailored to your recipient! 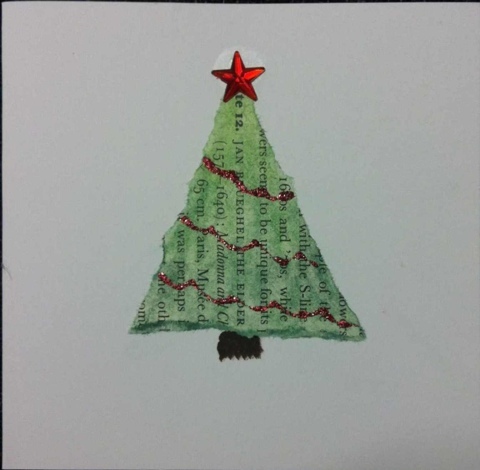 This year I’ve seen a few people using book pages in their craft – mainly on ATCs – and I’ve had a go at a few myself. Although to start with I did have problems with the mere fact that I had to destroy a book in order to use its pages! I’ve found that I am more mentally capable of such a dreadful crime (!) if the book book is old and tatty anyway. So I bought an old art book from a charity shop, and carefully took it apart so I could use it in my craft. I’ve used the picture pages to make some gorgeous handmade envelopes, and the written pages to use on these Christmas cards. Tear a page from an old book into rough Christmas tree shaped triangles. Use green chalks to colour the trees, particularly highlighting the torn edges. There is so much scope for decorating the trees individually. In the two examples here I’ve used adhesive pearls for baubles in one, and glitter glue for tinsel in the other. I’ve also used adhesive gems, brads, peel-off borders (which can also be coloured with permanent markers), and fibres. You can tailor a card to your recipient’s favourite colour very easily if you want too. At the top of the tree I’ve used star-shaped gems, but again, you could use pretty much anything that’s starry or sparkly! You’ll notice that I’ve used my book page with the writing running vertically. This is another example of me being frugal! It’s quite easy to tear a series of diagonal lines down a page and get lots of triangles, but if I had done this with the page horizontal, half of my trees would have had upside-down writing on. I’m sure this wouldn’t bother plenty of people, but for some reason I didn’t like the idea, but could happily tolerate sideways writing – go figure! The result was that I ended up using the entire sheet, and only threw away a tiny border from around each edge. So just one book page (approx A4) has made about a dozen cards, and I still have some left over! Another variation I have made on this theme is using a piece of sheet music (bought for 20p in a charity shop) in the same way. 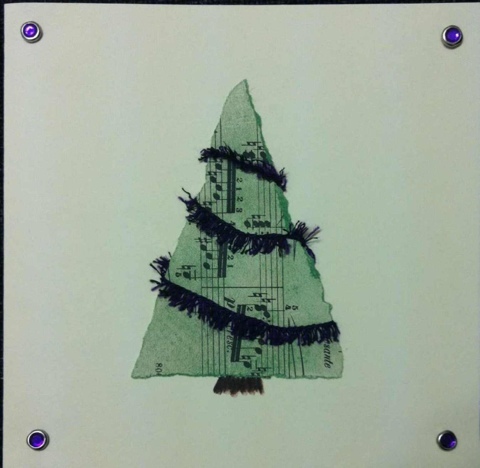 In this one I’ve used purple fibre as tinsel, and put a purple gem brad in each corner of the card. I love to buy craft magazines because they often have really lovely giveaways on the front, and also free papers inside the mag too. The robin topper on this card was a magazine freebie. I matted and layered it, and added some glitter glue to sparkle it up, and I’m really pleased with how it turned out. The silver “season’s greetings” tag was one of those items that seems to have materialised in my Christmas craft drawer. I’m sure I must have bought it at some point, but where and with what is anyone’s guess. Cut out a design from the free papers in a magazine. Accent with glitter glue. Mat and layer it onto two complementary colours of cardstock – I chose dark blue and silver. Cut a long strip of cardstock the same colour as the inner layer (dark blue in this case), and stick it across the card blank. Place a silver snowflake border peel-off along the strip. 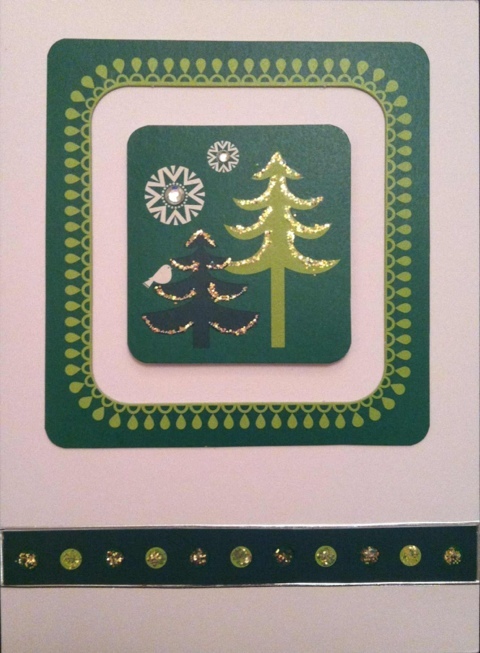 Mount the topper to the left side of the card using adhesive foam pads, ensuring it overlaps the snowflake strip. Mount a greeting in the space to the right of the topper. When it comes to strips of paper, peel-offs or ribbon that are partly covered by a topper, I’m afriad I’m usually super-tight with it. Unless I have heaps of it I will often cut it so that there is a gap underneath the topper! This is also handy if you’re using a particulary wide card and the peel-off doesn’t quite stretch the full width of it. I have only recently tried quilling. I got a quilling tool and some quilling papers (strips just 5mm wide) free with a magazine I bought at the start of November. These two cards show my first forays into quilling. I’m pretty pleased with them, apart from managing to get green ink all over random places on the holly one. But then that’s just me – I should have known it would be risky using a messy ink pad rather than my usual pens! Slide the end of a 15 cm strip of red quilling paper into the slot in a quilling tool, and wind the strip into a tight coil. Remove the tool and let the coil unfurl to a diameter of about 1.5 cm. Use a cocktail stick to place a drop of glue on the end of the strip, and stick it to the coil. Hold in place until it has set. Repeat until you have 4 coils 1.5 cm in diameter. Do the same with 4 strips of 10 cm red paper, but make the final coils approx 1 cm in diameter. Take each red coil and pinch opposite sides to form creases. This will make the petal shape. Make 2 leaves in the same way by using 15 cm strips of green quilling paper. Take 8 strips of yellow quilling paper, 7.5 cm each, and glue into a tight coil. To make the stem, take one 30 cm strip of green, fold into thirds, and glue the lengths together. As the glue dries, curl the stem gently with your fingers (careful – this bit is messy!). Use tweezers to pick up each coil, dip the underside in glue, then place carefully into position on a green card blank. Place the smaller red petals horizontally and vertically. The larger petals fit between them, diagonally. Once all coils have been positioned and left to dry, add a peel off sentiment, and a glitter glue border. My favourite thing about this holly card is that it is a gatefold card – it opens from the middle. The holly is placed on a panel that is attached to the left side. It’s also a very small and cute card – the blank is just 10 x 10 cm. Create 3 loose coils of about 2 cm diameter using 30 cm lengths of green quilling paper. Pinch opposite corners to a crease at three points around the coil. Use these 6 creases to help you form the holly shape using your fingers. Make 3 very tight red coils using 10 cm strips. 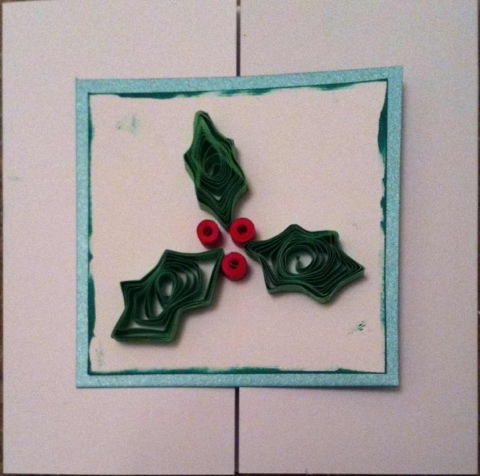 Glue the holly and berries to the centre of a 6 cm square of white card. Once the glue is fully dried, edge this card with a green inkpad for definition. Mount the white card onto a 6.5 cm square of light green card using double sided tape. Finally, mount the green card onto the left side of a 10 cm square gatefold card, again with double sided tape. Try not to get your fingers in the ink and then get your fingerprints all over the card! 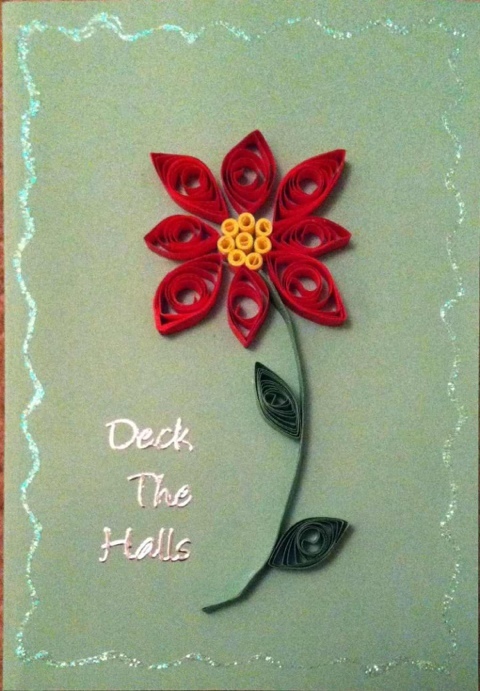 Quilling has so much potential – I do hope to spend a bit more time in the New Year have more of a play with it. However, I do have one gripe about it. As my quilling papers are 5mm wide, any card with quilling on is automatically classed as a ‘Large Letter’ by Royal mail. So the quilled cards I have made this year will be given by hand rather than posted. This is also something to consider if you’re putting chunky embellishments on your cards – often buttons and brads will push the thickness of card (plus envelope, don’t forget) over the 5mm limit allowed by Royal Mail, and cost you an extra 20-odd pence to post. As I’m such a cheapskate, before I write my cards I will divide them up into thick cards and thin ones – thin ones can be posted or given, but thick ones will generally be given by hand! For the last few years I have looked forward to November with both excitement and trepidation. Excitement because it is Crafts for Christmas and the Hobbycraft fair at Birmingham NEC, and trepidation as I know that I will inevitably spend too much money. Again. I first went to the fair in November 2005. My son was barely 4 months old and I was pretty much a crafting novice. Although it was a real experience taking a baby to a very busy show, in the end I was very grateful I had him with me because his buggy became a very handy shopping cart to carry all my purchases! If you have never had the joy of a Hobbycraft show, let me explain. The November event comprises 3 shows – Crafts for Christmas, Hobbycraft, and Art Materials – Live. It seems to be held over approximately 84 football pitches worth of ground, and attracts about 6 million visitors. Ok, that’s an exaggeration, but that’s what it seems when you walk in! This year 5 of us went together. A rather eclectic bunch – myself and my sister-in-law, my mother-in-law and her friend, and my 8 year old neice. We took lunches and and one of those wheeled shopping bags to store our goodies in at half time (a wise move, especially if you’re buying card blanks for example – they get very heavy very quickly). My usual ploy is to try and decide two things before I go – what I want to buy, and how much I am planning on spending. Taking cash and leaving credit / debit cards at home is a good plan as it ensures you stick to your budget (if you do this though, make sure you pay for the car park at the start of the day so you don’t forget!). This year, I really had no idea what I wanted. I certainly don’t *need* anything else – I can barely fit what I already own into my broom-cupboard of a craft room. So I went with only the plan of sniffing out a bargain. It has been discovered in previous years that I am very good at that. Last year I spent half what the others in my party spent, but ended up with 3 or 4 times the number of bags! (ok, I know it should be quality, not quantity, but never mind). And the big spend was on a fabulous paper punch and embosser which makes utterly gorgeous shaped and embossed paper flowers (like I need more paper flowers!). I have hardly stopped playing with it since I got it. I made a card using the punch and embosser. I was just playing with it and punching flowers out of a craft catalogue I’d got with one of my purchases. I realised that actually, the flowers were really pretty, and I soon got carried away and had made loads (my son helped with this bit too!). 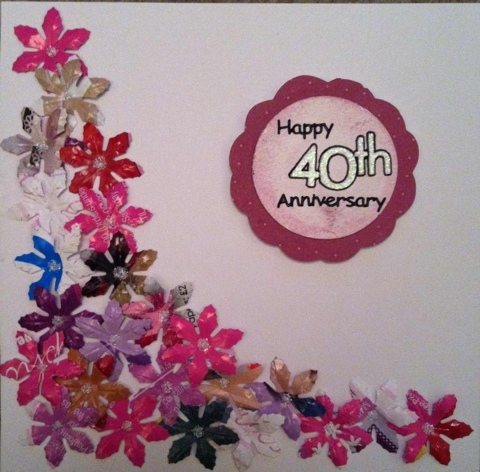 I put a dot of my new glitter glue in the centre of each flower, and then went to town sticking them on a card blank. I’m really pleased with the result, and I think I will be using that punch and embosser a lot!